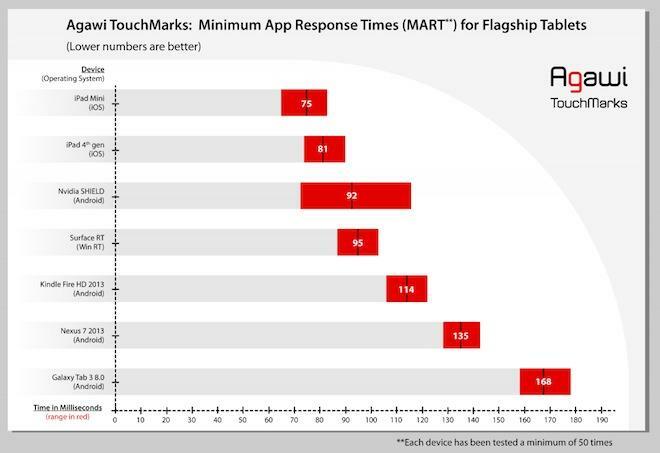 A study benchmarking the touchscreen latency of popular tablets shows Apple's iPad mini and full sized iPad 4 leading response times of other tablets, with Android offerings dead last. Cross platform mobile ad vendor Agawi has released test results from its TouchMarks study of various tablets, including Microsoft's Surface, Amazon's Kindle and Android tablets by Nvidia, Samsung and Google's Nexus-branded tablet built by Asus. The study measures how quickly apps can respond to touch events, quantifying the responsiveness, or laggy lack thereof, in tablets. The results are a combination of hardware quality and software platform responsiveness. 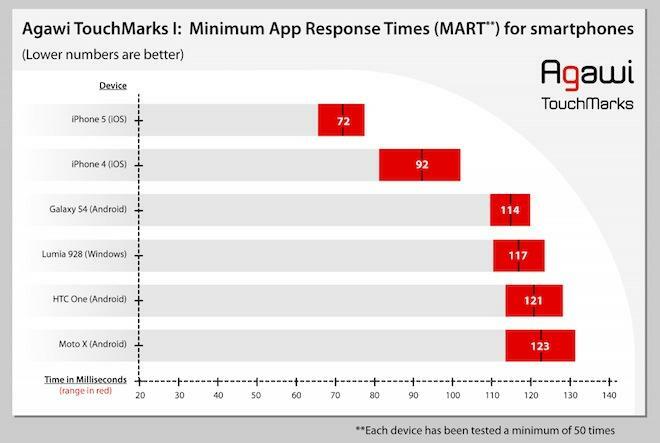 Apple's iPad mini and iPad 4 led the with scores similar to Apple's iPhone 5 in a previous benchmarking of smartphones. Apple's tablets scored a significant margin ahead of cheaper tablets, particularly Samsung's Galaxy Tab 3 and the Nexus 7, but also Amazon's latest Kindle Fire HD and Nvidias Shield, an Android dedicated gaming device with graphics specifications similar to iPhone 5s. Agawi said its findings were "a result thats perhaps now unsurprising," given that the previous test of smartphone responsiveness showed Apple's iPhones performing 1.5 times faster than the fastest high end alternatives on the market. Even Apple's 2010 iPhone 4 performed significantly better than current offerings ranging from Samsung's Galaxy S4, Nokia's Lumia 928, HTC One, or Google's MotoX. 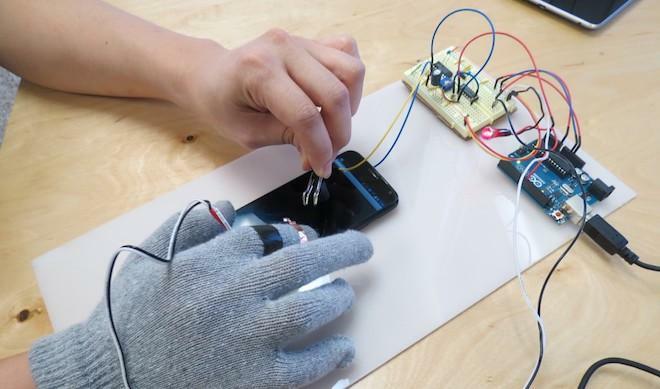 Improvements in touchscreen latency result in a more natural and responsive experience for the user, but most consumer products are aiming to deliver cheaper devices, resulting in the laggy performance easily discernible on these lower cost devices. As a result, the company concluded, "if you primarily use your tablet for reading, watching videos or browsing the web, then shop around and pick the best tablet  iOS, Android, Windows 8  that suits your needs. With their lower price points and high PPI screens you may find an Android tablet works perfectly for you. If, however, youre into latency-sensitive applications like games or interactive music apps, then your best bet might be an iPad."